This is a review of Case Logic SLRC-206 SLR camera bag, which is suitable for Canon Digital Cameras as well as any other brand of DSLR. It is a backpack style of camera bag. Click the top photo on the right to see what it can actually hold. This bag is definitely classified properly as a digital camera bag because it will store a 15.4 and 10.4 inch laptop computer. The laptop is protected by MemoryFoam on the underside of the lid. I'll start by giving you what I think is the most unique feature about this camera bag. It has hammock system that suspends your camera and lens above the bottom of the case. It's an alternative to getting one of the genuine bags made by Canon. This gives you superior protection without hindering quick access to your camera.The base of the backpack is waterproof and is structured to allow the backpack to stand on its own. 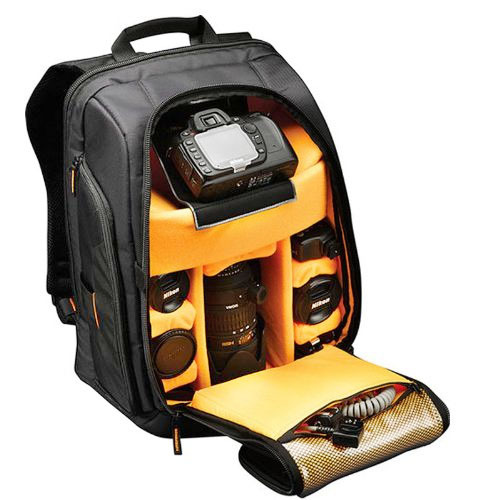 This camera bag calculates to a 95% 4-5 Canon Geek rating and that's pretty darn good. No rain cover, although a plastic trash bag could be used in an emergency. The hammock will not accommodate a full-sized dslr camera with a battery grip attached. For many photographers, this really doesn't matter. If your lens hood is attached, it may be a tight squeeze and catch on the hammock a little when removing. The tripod straps will only support a fairly light tripod. Size is 18.1 x 13.6 x 9.7 inches. Weight is about 4 lbs. There are two pockets on the inside of the main camera compartment. The pockets on the outside have some padding are are different sizes to hold different camera equipment accessories. 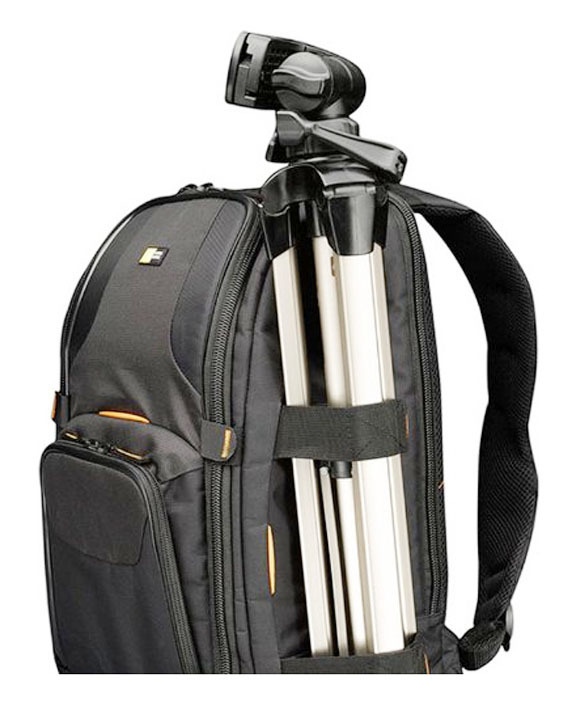 The new, upgraded version of this bag is the Case Logic Kilowatt KSB-102, a large Sling-type of backpack for pro DSLRs and a laptop. No matter where you like to buy your cameras and accessories, Amazon is a great place to get buyer reviews on anything. Because of the shear volume of camera equipment (and everything else) they sell, you get a large number of different perspectives from other photographers. My confession: I do a lot of my shopping there and they do give me a small "financial" thank you when I refer people to them. Reviews from People Who purchased the Case Logic SLRC-206 on Amazon. Shoot more photos with your Canon. Click Photo to Get a Good Deal on This Camera Bag at www.amazon.com.